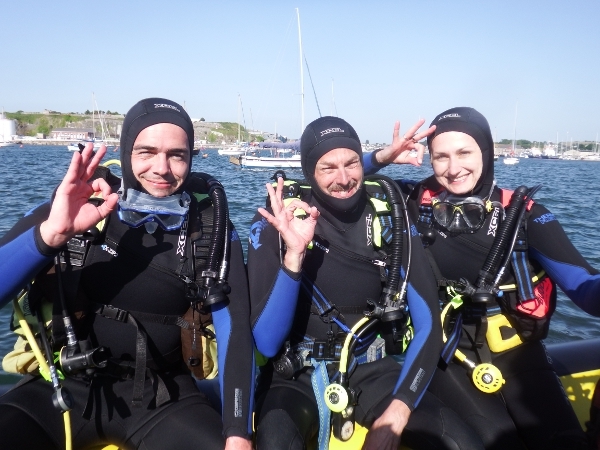 James and Helena, Clidive’s newest Ocean Divers, report on their first weekend. James and Helena undertake an epic journey from central London to Plymouth that would have taxed Phileas Fogg. The journey involves meeting up with Keiran (who was to take his Sports Diver test) at Heathrow Airport to hire a car. As excited/nervous as the group were about the weekend of diving ahead, nothing was going to be as tough mentally or physically as the effort of hiring a car from National on a Friday night at Heathrow. It was all plain sailing after this ordeal. 23:30: The trio arrive in the Boringdon Arms to complete a journey started in Liverpool Street at 16:15. Kieran braves drinks with the Clidive group still lingering around the bar, James and Helena, being sensible (or tired and boring) first time divers, don’t. The theory classes and pool sessions turn out to be a piece of cake compared to the efforts of putting on hired wetsuits and boots. James and Helena feel like they lose about 10kg in weight just kitting up in the Plymouth sun! The exhilaration and fun of the first trip out on the RIB into the sunny, yet very windy, Plymouth Harbour makes the entire trip worth it though. The pair agree that diving as well will be an added bonus. Alas, the swell is too great for the first dive to go ahead as planned, so Captain Keith redirects the boat to calmer seas over at Fort Bovisand. James gets paired with John (JD) and Helena with Orlando for their maiden dives. As the adrenaline starts kicking in and the groups prepare to plunge in, an emergency message on the boat’s radio broadcasts news that a local diver has gone missing. Thankfully, the diver is later found safe and well, but it’s a timely reminder that this isn’t the swimming pool anymore. Thanks to the superb efforts of JD and Orlando (and all the teachers at Clidive in previous weeks), both James and Helena enjoy fantastic first dives; getting to experience the reality of diving in the sea whilst also being able to see some of the marine life, get a feel for real diving and build up some confidence. The dreaded mask clearance tests go by without incidence and James successfully (and to the amazement of JD) performs the advanced diving manoeuvre of flipping off both fins at once and catching them and then putting them back on again underwater. Rather than immediately promote James as a Dive Leader/BSAC President, James is advised to tighten his fins more for the next dive. James and Helena are thrilled to find, upon surfacing and returning to the boat, that there is a bag full of chocolate to munch through. They agree this diving business just gets better and better. James sacrifices a chocolate minstrel to Poseidon. Which isn’t in the diving manual but should be. The second dive of the day is at the breakwater fort. James and Helena again enjoy themselves and get to learn a few more skills, pass a few more tests and see a few more underwater pleasures. Both agree they are officially ‘hooked’ on diving. A fine day is capped with some fine food, beer and company back on dry land. Not all the lessons James and Helena learn on the weekend come from the knowledgeable Clidive members. Some were found out through bitter experience. For example, eating a near double-sized fried breakfast and not taking a sea sickness tablet on a hot, but windy day, is asking for trouble. Not even a chocolate minstrel sacrifice to Poseidon is going to stop you from throwing up after that. Which is what James does immediately after his first dive on the Glen Strathallan on Sunday morning. Seeing the other members of Clidive tucking into the chocolate goody bag only serves to send James back to the side of the boat. In contrast, Helena emerges from the sea bearing the spoils of a nice, expensive diving torch she found on the seabed. Contrasting emotions for the pair. James and Helena also learn how hard it is to get wet wetsuits on. By the end of the weekend it feels like fingertips will fall off. 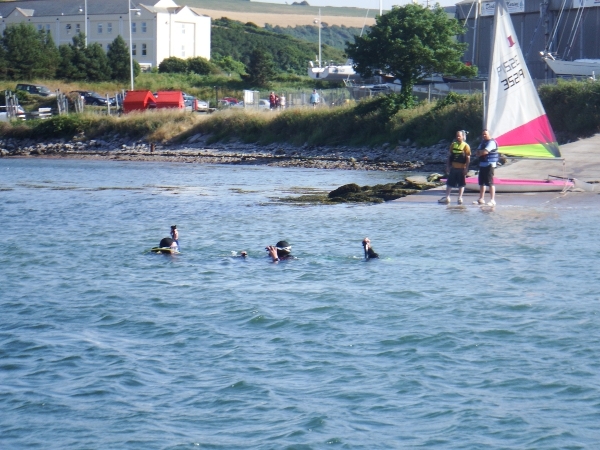 Experienced divers advise the pair to bring plastic bags and talc to ease the process for next time. The final dive of the weekend sees James and Helena pair up to dive with Mary and, due to weather conditions, a return to the break water fort. Whilst the visibility is low, James and Helena enjoy another great dive and even get to see a bit more marine life. Alas, Helena does not find any more free diving equipment. It’s with great reluctance the pair return to the surface to finish a superb weekend and an experience they will always remember. The weekend was a huge success as not only did James and Helena qualify as Ocean Divers but Adrian (Ocean Diver) and Kieran (Sports Diver) also gained their targeted qualifications. Well done to all. 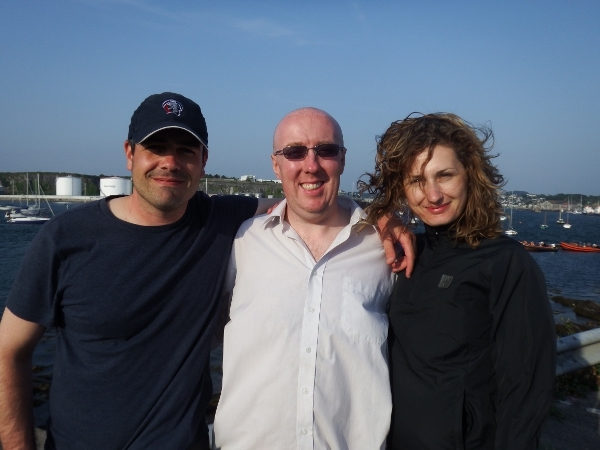 Note from James and Helena: We would like to thank all at Clidive who made the Plymouth weekend so much fun and such a great experience: Mary, Martin, Keith, JD, Keith B, Neil S, Kieran, Mark, Orlando and Adrian. A huge mention to May for all the hard work she put into planning the trip as well. We’ll be back for more soon! Additional appreciation to all the teachers and members of Clidive who taught us, helped us and gave us their time for the theory and pool sessions at Ironmongers. It is really appreciated. *Special thanks also to Neil for looking after the sea sick James on the Sunday dive! James, Keiran and Helena celebrate their new qualifications.